The Virginia Flaggers have now been on the ground for the past few weeks in Lexington protesting W&L’s decision to remove replica Confederate flags from the chapel and yet we have yet to see a single photograph of a student or alumni on the grounds calling for their return. “Plenty of support” indeed, just not the kind of support that matters. On second thought, perhaps I misinterpreted their strategy. 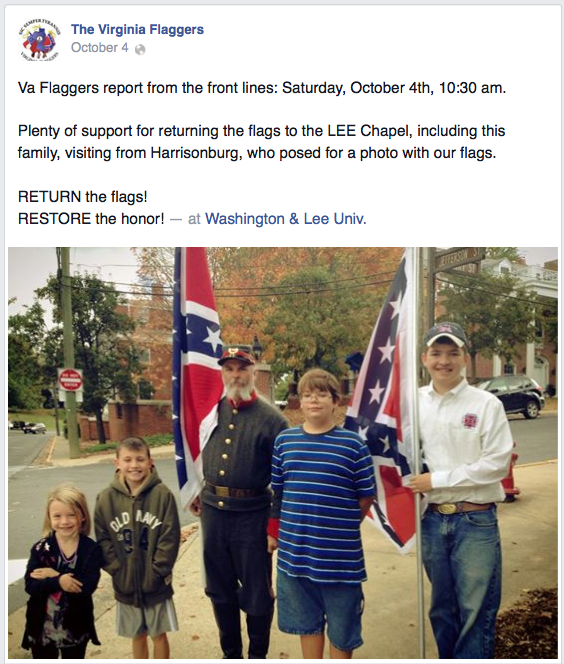 Perhaps the Virginia Flaggers are taking the long view and are preparing kids like these for admission to W&L. Once admitted they will bring about change from within. Brilliant. You have to be carefully taught, as Rogers and Hammerstein wrote for South Pacific. I am always irked to see children at any kind of thing like this. I wonder if they even knew what they were being a part of truly. So basically, the VA Flaggers are now a tourist attraction. I submit this as the Epilogue to Confederates in the Attic. These folks seem to have a lot of free time. Back in July, the Flaggers and the SCV had said that they were expecting more W&L students when school year started and here we are in October and their presence is still just the folks who are taking the drive to Lexington. I remember the Confederate flag at Lee chapel when I was a youth. Apparently you have an issue with how residents with a heritage connection want to remember and commemorate their history. I support the flag there and elsewhere, but of course I have ancestral connections to the Confederacy rather than some politically correct, agenda driven interpretation. Apparently you have an issue with how residents with a heritage connection want to remember and commemorate their history. At the end of the day, it’s the decision Washington and Lee. I support the flag there and elsewhere, but of course I have ancestral connections to the Confederacy. . . .